If something family-friendly can be done with a pumpkin, it has been done at the Circleville Pumpkin Show. Circleville is a small town in central Ohio whose most notable feature is that it houses Hivelys, such as my aunt and uncle, thereby disproving that the Midwest is entirely bland. It also puts on the annual Pumpkin Show, a harvest festival that focuses on, you guessed it, corn. Just joshing! Corn is another Midwestern stereotype. The Circleville Pumpkin Show has always focused on pumpkins, ever since the mayor started the festival in 1903. The way I read it, all the area farmers back inna day were wagoning their harvest bounty to town, and the mayor wanted to appreciate their wives’ produce. So he set up displays and established a competition for the largest pumpkin grown by a lady. Ever a visionary, the mayor also held a competition for the largest pumpkin grown by regular guy farmers, thereby striving for gender equality a full century before we still don’t have it today. Which is really too bad, because the festival carries on precisely how the mayor envisioned over a hundred years ago, with the world’s largest pumpkin pie, pumpkin waffles, pumpkin pizza, pumpkin ice cream, pumpkin chili, pumpkin donuts, pumpkin pulled pork sandwiches, pumpkin capuccinos, pumpkin kettle corn, carnival games where you can win a Justin Bieber poster, the face-painted Pumpkin Show Man navigating crowds on rollerblades, and beauty pageant competitions for the Pumpkin Show queen. My uncle wanted me to have the full Pumpkin Show experience this fall. He signed me up to sell pumpkin coffee and ride on a float in a parade alongside eight strangers and a roasted chicken. 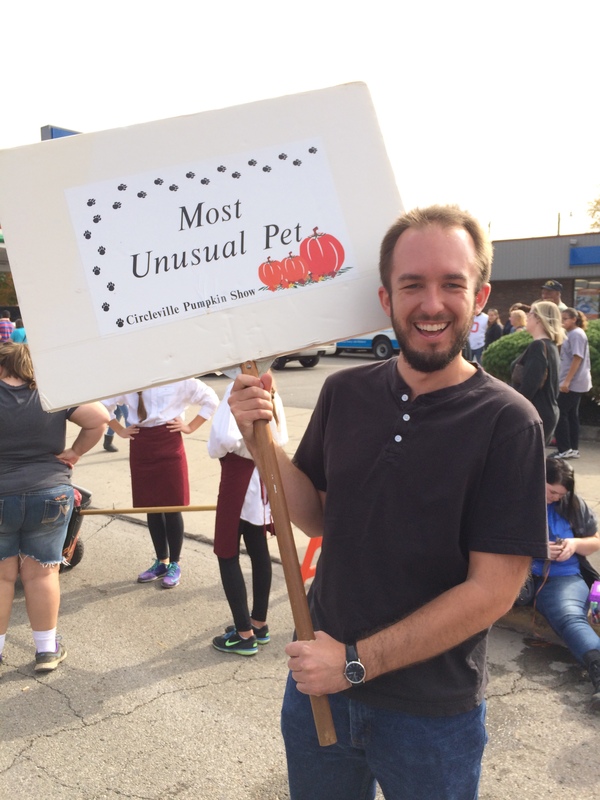 He took my picture with the “Most Unusual Pet” parade placard. But he did NOT enter me for the Miss Pumpkin Show competition. So, in the spirit of gender equality, here is my at-large application for next year’s crown, answering the same questions asked of my competitors. Hobbies: Doing family-friendly things to pumpkins, such as sawing them open with serrated knives, gutting them, and displaying their corpses to the neighborhood. I also enjoy consuming their flesh from tin cans. Plans after high school: Take the bus home, eat a sandwich, probably take a nap. But I have to go with the 1998 pet parade. My uncle loaned us the gerbil tank from the school where he works. Lo, the gerbil had that very morning given birth to half a dozen babies! My sisters, my cousin, and I dragged those gerbils through downtown Circleville, and when we returned to the staging area, there was only the mama gerbil left. And boy, was she stuffed. Somehow, we did not win the Most Unusual Pet category. As Pumpkin Show queen, I will institute a Greatest Attrition category for all future pet parades. Favorite thing to do at the Pumpkin Show: Once again, there are just so many choices. But I would have to say my favorite activity is eavesdropping. Eavesdropping? What do you hear? I can’t tell you! That would be rude. Besides, the Baby Parade entrants really weren’t as ugly as people said. What qualities do you have that you believe would make you successful as Miss Pumpkin Show, if chosen for the honor? Diversity. I would be the first queen to break countless, possibly up to a dozen, glass hurdles. I’d be the first queen with an unplucked beard, and the first on this side of twenty. A real Jackie Robinson in the realm of Pumpkin Show queens. If you could travel to any event in the United States to promote the Circleville Pumpkin Show, where would it be and why? The Great American Beer Festival in Denver, Colorado. 700 brewers. 3500 beers. Limitless samples. How would you describe Pumpkin Show to someone who has never experienced it before? Well, I described it already, so instead, here is a new slogan suggestion. 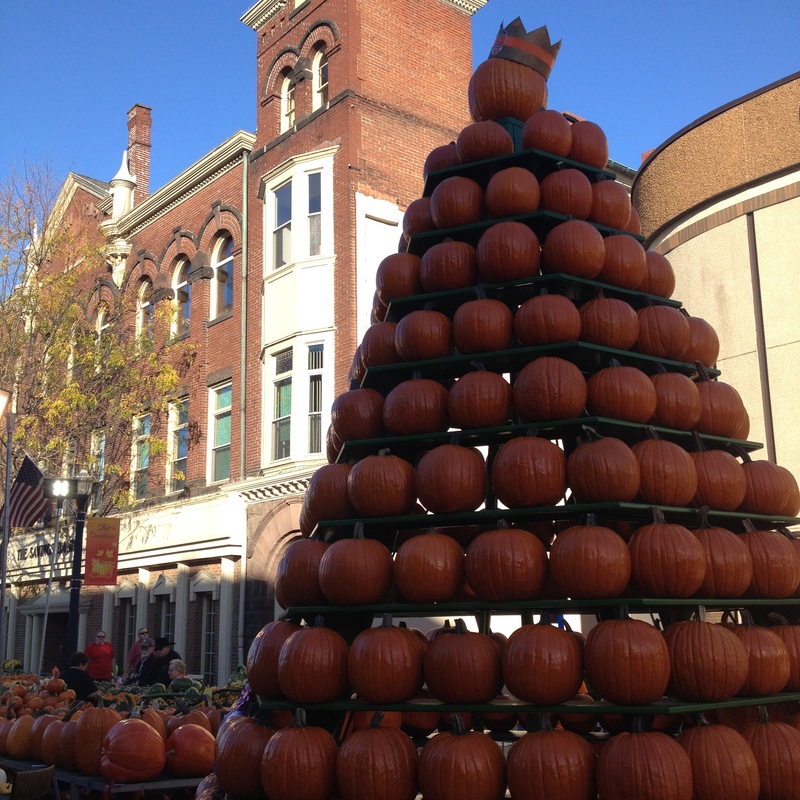 The Circleville Pumpkin Show: Come for the pumpkins, stay for them too! And ladies, please keep your distance from the mayor.